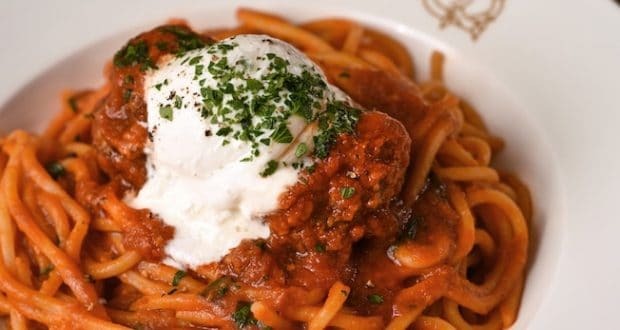 In the middle of winter 2017–18, the area of Disney Springs known as The Landing saw the opening of a new trio of concept restaurants — Pizza Ponte, Maria & Enzo’s Ristorante, and Enzo’s Hideaway — that not only serve up Italian-style fare in their own unique ways, but also share a romanticized “backstory” together. As the story goes, Maria and Enzo were a husband and wife who immigrated from Italy to the States and ran a bakery in the town of Disney Springs, located in the airline terminal there. After the terminal shut down the couple opened up a pizza shop of their own (Pizza Ponte), which was so successful that they were able to buy that old airline terminal and turn it into an air travel-themed trattoria, which they simply named Maria & Enzo’s Ristorante. There’s more to the backstory, but we’ll stop there for now, since today’s restaurant review is focused on Maria & Enzo’s specifically. Let’s get to it! So, what does this stunningly designed eatery have to offer? Well for starters, Maria and Enzo clearly decided to roll with the 1930s airline terminal aesthetic. You’ll notice once you enter the building that its unassuming exterior belies a stylish interior that should please all manner of jet-setting wanderlusters out there. After you make your way through the “passenger check-in” entrance and the team of flight attendants greeting you there, you’ll find yourself on the second story of a grand, large-windowed dining room full of colorful flourishes and elegant, era-appropriate travel decor—which makes sense, since this used to be the terminal lobby—with a lovely view of the waterfront outside. The scene is further set with background tunes, which alternates between Italian music and songs by the likes of Frank Sinatra. All in all, this is a wonderful environment to dine in—bright and debonair, without being too kitschy. As we mentioned earlier, the cuisine at Maria & Enzo’s is of the authentic Southern Italian variety. On the menu you’ll find classic Sicilian offerings to please any palate. As you wait for your order to arrive, you’ll be served fresh, tasty bread with olive oil to dip into. Yummy. We recommend starting off with an appetizer plate of Arancini di Carne, which are traditional fried rice balls stuffed with meat ragù, peas, and mozzarella. Alternatively, you can’t go wrong with the crispy fried calamari with hot peppers and spicy tomato-and-garlic aioli sauce. When it comes to entrées, where do we even begin? There’s not a single bad choice on the whole menu. Whether you opt for the typical spaghetti and meatballs, or the Rigatoni ‘Norma’ pasta dish, or the dry-aged ribeye steak, or the grilled ahi tuna—or any of the other dishes we haven’t even gotten to try yet, but will be remedying soon!—there’s no way you’ll leave here without filling up on something delicious. One thing you’ll notice as you dine here again and again is that the menu does seem to change from time to time. We assume the chef is hand-selecting dishes that are in season and likely to be the best-tasting for whenever you visit, but you’d have to ask them to know for sure. In any case, it’s always nice to have some variety! Did you save room for a post-meal treat? We hope so, because they have a handful of them to choose from. They’ve got your standard-issue cannoli and chocolate-marscarpone cheesecake options of course, but we also heartily recommend the Affogato di Vesuvio, which is a crema gelato flavored with espresso and topped with chocolate whipped cream and white chocolate snow. Talk about decadent! If a little pick-me-up is what you’re after more than something sweet, they have a selection of coffee beverages available as well, including espresso, caffè lattes, and—if you’re feeling feisty—Caffè Corretto Grappa, which is coffee with a small amount of grappa brandy. Be careful with that last one, folks. Speaking of alcoholic beverages, Maria & Enzo’s has an extensive list of wines and cocktails for you to enjoy, as any proper Italian restaurant should. There’s too many options to go into here, but we will say that you should be sure to check out their seasonal cocktails for a taste of something truly interesting. As you may tell, we’re already big fans of this elegant trattoria. The next time you’re in Disney Springs, don’t hesitate to stop in and sit down for a delicious meal while you enjoy the ambiance. You can thank us later.